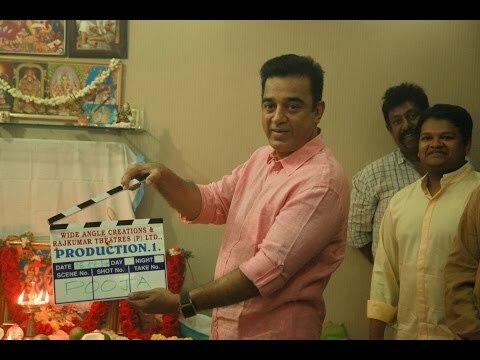 Despite the Kerala district court order to deposit 10 lakhs rupees to proceed further with the ‘Drishyam’ Tamil remake, the team ‘Papanasam’ has started their work in & around Tenkasi since yesterday. Read here to know more about the case filed against Jeethu Joseph. Kamalhassan is sporting a thin moustache, and Gauthami was sitting next to him. The makers have decided to complete the movie in a quick time & planning to release for the Tamil New year, 2015. Ghibran is scoring the music while Wide angle creations & Raj Kumar Theatres Pvt Ltd are producing this drama thriller. Meanwhile, Kamal’s ‘Uthama Villain’ is getting ready for an Oct release & ‘Viswaroopam 2’ is eyeing for Pongal. « சௌந்தர்யாவை தொடர்ந்து ரஜினியை இயக்கும் ஐஸ்வர்யா?